Stepping aside from traditional waste tire recycling applications, Imperllanta, a Mexican company, brings completely different approach of how to process recycled output. With its distributer licensing system Imperllanta offers to tire recyclers an opportunity to diversify their portfolio with new uncommon applications. In Mexico, like in many other Latin American countries, many tires are thrown away. Currently this figure amounts to 40 millions of tires per year and the waste is growing. Many tires are still utilized in conventional and cheapest way, e.g. by burning them. This process produces toxic emissions, which destroy our environment and cause illnesses like cancer, dengue and illnesses of the respiratory system. Trying to fight against this pollution, a Mexican company Imperllanta has developed applications for products made from recycled materials. The mission of the company is to promote sustainable ecologic and social development and utilization of the rubber waste. Imperllanta operates through distributors and sub-distributors, the former accounting for 70 and the latter for 30 in Mexico. The company has been investingating in the recycling area for 20 years, developing equipment and applications, which allowed to recycle up to 300 tons of rubber waste materials such as tires, PET and Unicel, having the final goal of environmental improvement. 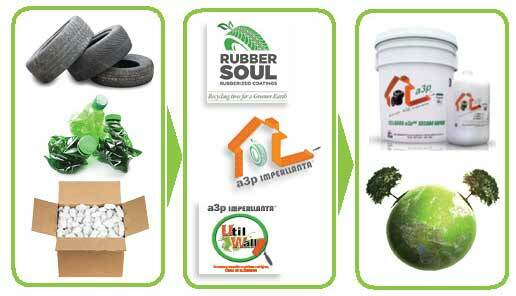 The product allows receiving for every recycled tire 10 sqm. of Imperllanta without producing any emissions of CO2. Additionally, for each bucket sold, there will be a tree donated to help to reduce the damage of the ozone layer of the planet. The question whether there is a potential for this application can be answered by simple looking at statistics: there are 24 cities in Latin America, which account for 9.4% of the world population, where the coatings from recycled rubber waste can be applied. Especially for existing tire and rubber recyclers Imperllanta is of great interest: on the one hand, as an opportunity for vertical integration and extension of their product line, and on the other hand, as an application for their output. Based on the total investment of $500,000 (rights, know-how and manufacturing equipment) and the production quantity of 5,000 buckets per month, the payback period is estimated to be about 6 months. - Adherence and firmness on the main construction materials such as concrete, cement, mortar, etc. Imperllanta is currently expanding in South and North America and is now expanding into Europe. General Recycling is its exclusive representative in Europe and can provide you with all product and technology information. Be the first to implement this profitable and new application on the European market!